Cons: Heavy abridgement, and slightly hammed up Ophelia and Gertrude. An engrossing Hamlet that can make you feel like you’ve never seen it before. Back to the Park Theatre, and back to Hamlet, this time abridged and renamed Hamlet, Who’s There? Fresh productions of this most over-performed tragedy do beg the question ‘what’s new about it?’ Too often the answer is not enough. Flute Theatre have shaken it up alright. They have introverted it, turning the whole thing inside out and squeezing it into one room (Hamlet’s), on the gut-wrenching night following Gertrude and Claudius’ wedding. It becomes intensified in its insularity and the narrative palpably throbs. 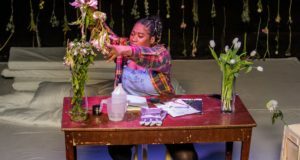 In part, Flute Theatre’s success is due to how well they have managed to retain the text’s essentials while hacking it down to a digestible size. 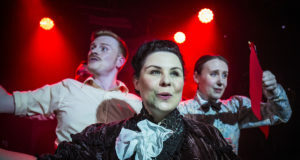 Their touring production comes across as a kind of Hamlet’s greatest hits: all the finest soliloquies strung together, interspersed with a classic murder or two, with sanity hanging by a thread throughout. Kelly Hunter directs as intricately as she adapts (she also plays Gertrude, but more of that later). She develops an intense atmosphere: a claustrophobic mood that leaves one gasping for deep, guttural breaths every second. There is no set to speak of: a cheap leather sofa, a littering of old photographs and some yellow roses, all of which keep the mood intact. Mark Quartley’s Hamlet is astonishing. He is so full of suppressed anguish that he virtually rumbles, but quietly. Hollow-eyed and desperate, he is slowly descending into his own mind but he refuses to make a song and dance about it. In the rare times that Quartley isn’t on stage, he is in the shadows, omnipresent like the constant battering of his uncle’s crimes upon his sanity. I can’t remember ever having felt so emotionally tethered to a Hamlet (and I saw Cumberbatch). The rest of the actors aren’t as successful. Tom Mannion is sufficiently grating as Claudius. Finlay Cormack’s Laertes is a little too green to ever be angry enough to kill. Francesca Zoutewelle’s Ophelia starts off beautifully, with stomach-churning control, but that control is lost later on, and she milks it towards her death. Director Hunter’s Gertrude was more indulgent throughout, at times over-balancing the moments of intensity. By the curtain, I wished it had all been different for Hamlet. I wished he had checked behind the sofa. I wished he had acted sooner. I wished the characters could have stayed with me. I wished that it didn’t have to end. And that is high praise indeed.